Find us at the MAST table in the STScI booth at the AAS 2016 Summer meeting. MAST has been participating as a American Astronomical Society exhibitor for several years now. 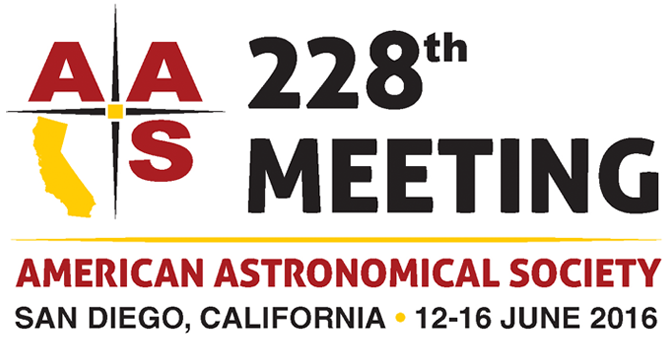 You will find us again at the MAST table in the STScI booth at the upcoming AAS 2016 Summer meeting in San Diego, CA from June 12-16. Our main focus of attendance is to educate the astronomical community on the MAST archive, its data holdings, and search interfaces. We accomplish this mostly by giving live demonstrations on how to use our interfaces to search, analyze, and download data. In recent years we have been showcasing our MAST Discovery Portal. We have found it to be helpful to give live demonstrations of the portal, as it is a pretty powerful tool. Our offerings are not solely interface focused. We also have updated materials on new data products and the archive in general. We have found in the past that we get a good variety of people coming to visit our MAST table. We meet undergraduate students just starting out in astronomy that are interested in all of the modern ways we search data. We also get all levels of educational professionals coming to the booth, where we provide them with educational resources and offer teaching ideas for the classroom. And, of course we meet with seasoned astronomers who have specific questions about their particular research project. Interacting with AAS attendees at the booth has been a great opportunity to get to meet our community, and we hope you will come visit us if you are attending the AAS this summer or at future meetings! MAST will be hosting the Pan-STARRS PS1 data release: nearly 2 petabytes of images and catalogs. Pan-STARRS – the Panoramic Survey Telescope & Rapid Response System – is an innovative wide-field imaging facility developed at the University of Hawaii's Institute for Astronomy (IfA). The first telescope, PS1 on the summit of Haleakala in Maui, has been scanning the sky since May 2010. With the largest digital camera ever built – 1.4 billion pixels spanning an unprecedented field of view of 7 square degrees – the system is generating a time-lapse movie of the three quarters of the sky visible from Northern latitudes in 5 pass-bands (g,r,i,z, y). The PS1 data – more than a terabyte of images every night – offers temporal information on the variability and celestial motion for billions of objects. A major goal of Pan-STARRS is to search for asteroids and comets that might pose a danger to our planet. But its database also offers vast research possibilities in many other astronomical areas, particularly those involving time variability. Thus far PS1 has discovered a number of potentially hazardous asteroids as well as new comets, and a new class of very luminous supernova explosions. 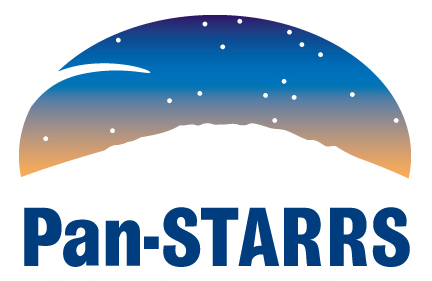 Pan-STARRS builds on the tremendous success of the Sloan Digital Sky Survey (SDSS), which imaged about one quarter of the sky, and is a pathfinder for the yet more ambitious Large Synoptic Survey Telescope (LSST). Like SDSS, PS1 is carrying out a dedicated survey and will generate catalog and image data products to serve a large community of astronomers pursuing many science goals. With 1.5 petabyte of raw image data, the PS1 survey roughly represents the geometrical mean between SDSS and the expectations for LSST. It thus posed a tremendous challenge both for data analysis algorithms and data management procedures. To fully exploit the scientific potential of the PS1 survey data, the Pan-STARRS team is committed to making the data available to the broader astronomical community. To this end, they have joined forces with the STScI, which has many years of experience with the Hubble Space Telescope and Multi-Mission data archive (MAST). At this time, the 1.5PB of image data has been processed and then transferred to MAST by physically shipping the disk arrays. The final catalog database is being constructed incrementally and each increment is being copied via sftp to MAST. Since the estimated final database size is approximately 125TB, this transfer is expected to take 2-3 months to both copy and bring on-line here at STScI. A decision on the final release date will be made sometime during this transfer of data. The Pan-STARRS catalogs and images will be accessible through a variety of interfaces, including the MAST Portal, CasJobs, and scriptable interfaces including Virtual Observatory-compatible cone searches. MAST will provide access to the upcoming data release from the Gaia mission. 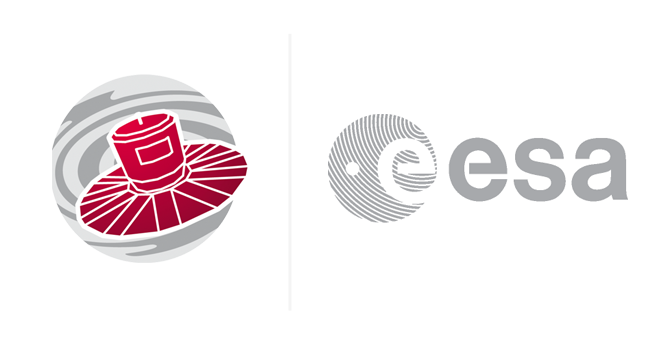 The MAST archive has a formal agreement with ESA to be an affiliated data center for GAIA data products. The first data product will be a catalog and will be transferred to MAST and ingested into a publicly accessible database as quickly as possible. Assuming no delay in the Gaia release, we hope to have the Gaia data available in October/November 2016. In addition to allowing Virtual Observatory conesearch webservice queries, it will also be available within the MAST CasJobs environment so please make sure you have a CasJobs account. A future benefit of Gaia is that the HST Guide Star Catalog will be updated to use Gaia astrometry, significantly improving the absolute coordinates of HST observations. We expect this improvement to be available for the next observing cycle. Several groups have produced extracted, detrended light curves for long-cadence K2 targets. 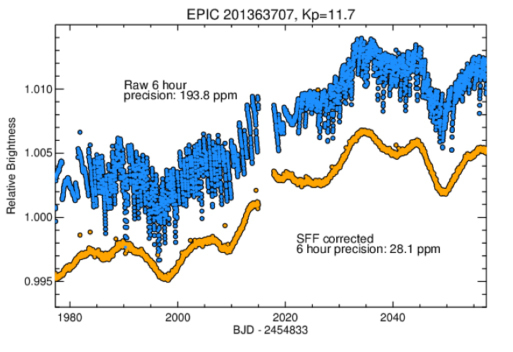 Example of raw (blue) vs. detrended (yellow) light curve for a K2SFF target. The K2VARCAT and K2SC teams achieve similar improvements in reducing systematics. The K2 data have unique systematics compared to the original Kepler data because of the way the spacecraft maintains its pointing with only two reaction wheels. The spacecraft’s thrusters are fired every ~6 hours to correct for drift as the spacecraft uses the solar wind to balance along the axis not controlled by the other two reaction wheels. Several groups produced extracted, detrended light curves for long-cadence targets, using a variety of methodologies. These light curves are available at MAST as High Level Science Products, both on their project pages and in the MAST Portal. K2SFF (Vanderburg et al. 2014a, 2014b, 2015) have provided detrended versions for all released Campaigns, including the short engineering run before Campaign 0 began. The team provides detrended versions of each target using 20 different apertures (10 circular, 10 based on the pixel response function), as well as a variety of diagnostic plots. K2VARCAT (Armstrong et al. 2014, 2015, 2016) provide detrended light curves as well as variable star classifications using supervised and unsupervised machine learning techniques. In addition to the detrended light curves, K2VARCAT targets include probabilities of belonging to several variable “groups”, for example, RR Lyrae, Detached Eclipsing Binary, Semi-Detached/Contact Eclipsing Binary, gamma Dor, etc. K2VARCAT includes data from Campaigns 0-4. K2SC (Aigrain et al. 2015, 2016) use Gaussian processes to model systematics and astrophysical variability jointly, with the intention of preserving stellar variability as much as possible while removing the instrumental systematics. Data from Campaigns 3-6 are available for K2SC. A team led by Max Mutchler has provided a curated set of 957 observations of solar system objects imaged by HST. 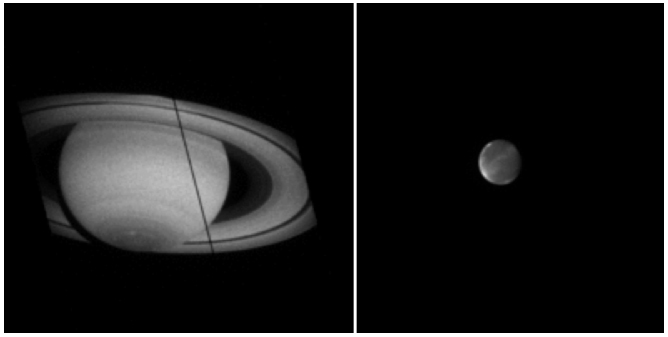 Processed images of Saturn (left) and Mars (right) from the Moving Target High Level Science Product. Moving targets (planets, natural satellites, comets, asteroids) observed by HST require special processing to maximize image quality. A team led by Max Mutchler has provided a curated set of 957 observations of moving targets obtained with ACS, WFPC2 and WFC3. Unlike the standard HST data reduction pipeline, the images in this High Level Science Product are not combined, are optimally resampled onto a common pixel scale, and are consistently oriented such that North is up. LA Cosmic and AstroDrizzle are used for cosmic ray rejection and pixel resampling, respectively. Several preview plots are available for each target, and individual observations from a given target and program are all accessible with the MAST Interactive Displays. An interactive table allows you to filter on program ID, target description, or instrument. For more information, visit the MAST Project Page: archive.stsci.edu/prepds/mt. The MAST Users Group provides essential input from the astronomical community on archive operations and development. The MAST Users Group (MUG) provides essential user perspectives on archive operations and development, including suggesting priorities for short and long term operational and scientific enhancements to the archive. The MUG meets annually and MUG members serve a nominal 3-year term. The most recent MUG meeting was January 14-15, 2016. During the MUG meeting, STScI staff members make presentations on topics requested by MUG members and on projects currently underway in the archive. The MUG sends a report that contains suggestions for improvements, topics they would like to know more about, and also discusses those areas and projects they think are valuable. The MUG representatives, the meeting agenda, and the most recent MUG Report are all posted online at http://archive.stsci.edu/mug/. Most of the presentations are attached to the agenda. Sarbani Basu was the chair of the MUG for the January meeting, and Todd Tripp is the chair of the MUG for the next meeting. Prior to each MUG meeting, MAST administers a user survey of the astronomical community. The results of this survey, including comments, are summarized as a presentation in the Supplementary Material section of the agenda at this link (PDF): http://archive.stsci.edu/mug/mug_2016/mugjan2016_survey.pdf. We find the comments users make on the survey very interesting and helpful. If you have a question, suggestion, observation, or comment about the archive, interfaces and webpages, please to not wait for the next survey. Send your comments via email to archive@stsci.edu. We try to respond to mail within a day or two and value your input. STScI now provides journal authors with Digital Object Identifiers to create unique and permanent links to MAST data. When you read an article in the literature about data that can be found in MAST, it can sometimes be hard to tell what data were used to make it. Sometimes authors can describe the data easily, if it comes from a single observing program, for instance. But some authors include many different data sets in a single study, and figuring out precisely what they used can be difficult. Papers with links to data are typically well cited, but normal URL links die, and only give you the data without all the context and metadata MAST can provide. To help solve this problem, we developed a Digital Object Identifier (DOI) system for MAST. DOIs are essentially permalinks, and have been used for years to refer to articles in the literature. We now provide these DOIs for sets of data hosted at MAST, such as large catalogs, High Level Science Products, and often used data sets, such as the Kepler quarters. In addition, we have built an interface on top of the MAST Portal that allows a user to collect any observations in MAST together, put them in a “basket”, and make a DOI for that collection of data. This DOI can be used in articles, or passed between investigators as a way to share carefully culled collections of data. We have formed a partnership with AAS Journals, to help authors add these DOIs to their ApJ, AJ, ApJL, and ApJS papers. The system is live now at archive.stsci.edu/doi/search — give it a try! Learn how to cross-match your target list against several catalogs both internal and external to MAST. 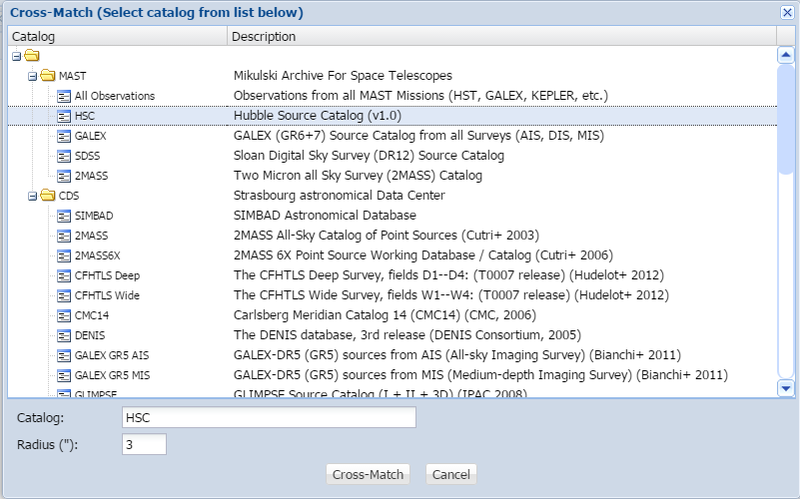 An important feature of the MAST Data Discovery Portal is the ability to cross-match against several catalogs both internal and external to MAST. A common use-case is to upload your own target list, in CSV or VO Table format, to the Portal to cross-match against another catalog. 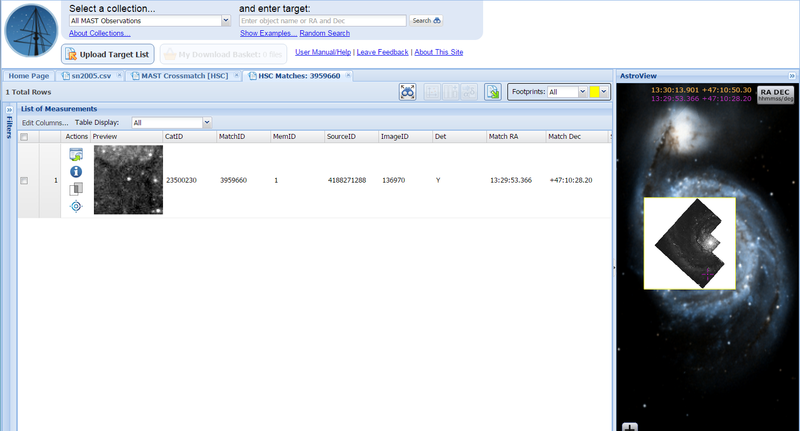 To begin, create an input target list as a CSV file with appropriate column headers and position information (e.g. Target Name, RA, and Declination). Next, select the “Upload Target List” button in the top-left of the Portal, browse to the file, and click “Upload”. The CSV data will be loaded in a line-by-line grid and appropriate data filters will be generated. To perform the cross-match, use the binocular icon above the grid to open the Cross-Match dialog, click the desired mission from MAST or CDS, adjust the match radius from the default of 3” if necessary, and click the button to Cross-Match. The resulting data will be composed of the columns from the original target list and the columns from the cross-matched catalog. 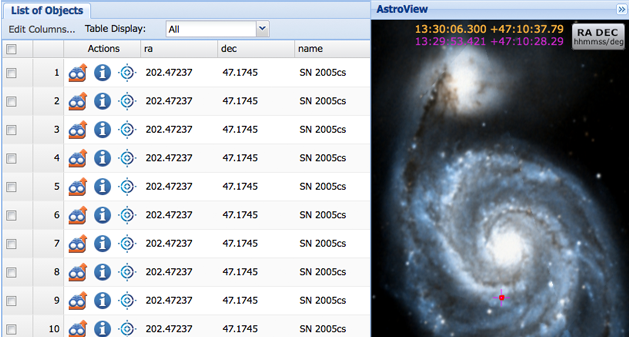 Example of cross-matching in the MAST Discovery Portal: Matching supernovae in M51 to the Hubble Source Catalog. An example user story for performing a cross-match is to match a list of supernovae from 2005 against the Hubble Source Catalog (HSC) in order to find Hubble observations of the progenitor prior to the supernova. Our example CSV file contains columns for name, RA and Declination and can be matched against the HSC with a radius of 3” following the above instructions. The resulting list contains actions that are normally available via a HSC cone search, most importantly the action to load the individual observations containing the HSC object. Filtering the start time to exclude all the times occurring in 2005 or later results in a list of supernovae that may have been observed by Hubble. One of the examples from the user’s match list is SN 2005cs, which occurred in the Whirlpool Galaxy M51. Clicking the “Load Detailed Results” action button on the row loads the individual observations in a new tab. This new grid contains one WFPC2 measurement for this object in the F547M filter, with actions to view more information or overlay the image in AstroView. After overlaying the image, the user is able to zoom into the image and see that the supernova position is nearby a HSC detection. Clicking the overlay button a second time will invert the image, and again to hide it. The Hubble detection of the progenitor SN 2005cs was previously discovered by Maund, Smartt and Danziger in 2005, but with the HSC and MAST Portal, it is much easier to generate a list of other progenitor candidates using the cross-matching feature. Cross-matching is a powerful tool for searching the resources available to MAST and discovering new data. You can find video tutorials for the cross-match and other searches on our Portal documentation pages or on our YouTube channel. We hope to add more catalogs in the future, and welcome your suggestions on resources to include. This newsletter is a MAST publication produced by Jonathan Hargis, on behalf of the entire MAST staff, who welcome your comments and suggestions.